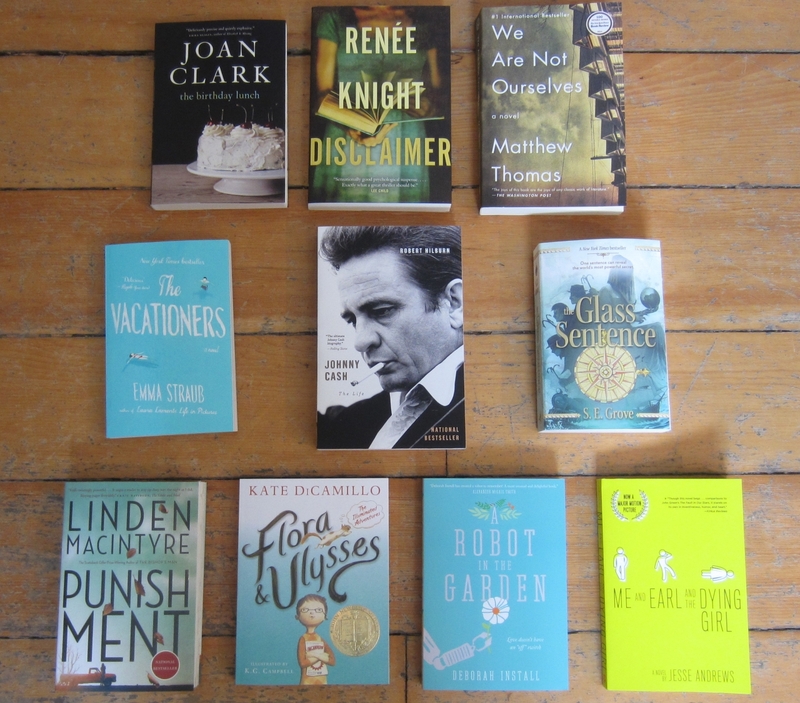 It’s been a while since we’ve done a book post…here are some of our most recent new arrivals – others have left the shop before we’ve had a chance to post them up! If there’s a book you’re looking for that we don’t currently have in stock, just let us know and you’ll automatically get 20% off the retail price of it when we order it in new for you! From the bestselling author of Latitudes of Melt and An Audience of Chairs: utterly engrossing, unsettling and beautifully written, The Birthday Lunch is the story of one pivotal week in the life of a family facing a tragic loss. Joan Clark’s riveting new novel opens as Lily McNab wakes up on her 58th birthday, June 30, 1981, in the quiet, picturesque town of Sussex, New Brunswick. Free-spirited Lily has always played the peacemaker between her fierce, doting sister, Laverne, and her loving, garrulous husband, Hal, as they competed for her attention, and the competition has only gotten worse since they all moved into the same big house. Today Laverne feels she’s beaten Hal out for Lily’s company at a birthday lunch, but it’s a bittersweet and short-lived victory. When the sisters stop for celebratory ice cream cones at the town’s famous Creamery after lunch, Lily is struck and killed by a speeding gravel truck. In The Birthday Lunch, Joan Clark explores the shock of unexpected death and the (occasionally comical) business of grieving. Each member of Lily’s family comes alive in their unique confrontation of loss: Hal’s open sorrow, her daughter Claudia’s re-examination of her own choices, her son Matt’s determination to expose the young truck-driver’s liability. And, unforgettably, Laverne’s eccentricity and isolation, her intensifying conflict with Hal, illuminates the brutal territory of blame and regret. Suspenseful and moving, with a powerfully evoked Maritime setting, The Birthday Lunch is an extraordinary novel from one of our most gifted storytellers. In this, the definitive biography of an American legend, Robert Hilburn conveys the unvarnished truth about a musical superstar. Johnny Cash’s extraordinary career stretched from his days at Sun Records with Elvis Presley and Jerry Lee Lewis to the remarkable creative last hurrah, at age 69, that resulted in the brave, moving “Hurt” video. As music critic for the Los Angeles Times, Hilburn knew Cash throughout his life: he was the only music journalist at the legendary Folsom Prison concert in 1968, and he interviewed both Cash and his wife June Carter just months before their deaths. Drawing upon a trove of never-before-seen material from the singer’s inner circle, Hilburn creates an utterly compelling, deeply human portrait of a towering figure in country music, a seminal influence in rock, and an icon of American popular culture. Hilburn’s reporting shows the astonishing highs and deep lows that marked the journey of a man of great faith and humbling addiction who throughout his life strove to use his music to lift people’s spirits. For floundering 34-year-old Ben Chambers the answer is obvious: find out where it came from and take it there to be fixed, even if it means risking his marriage in the process. Determined to achieve something for once in his life, Ben embarks on a journey that takes him and the endearing robot, Tang, to the far side of the globe…and back again. Together they will discover that friendship can rise up under the strangest circumstances, and that Artificial Intelligence can teach a man what it is to be human. Previous Post Discounted books – save big!